Like many industries, the work-at-home world has many terms that often get mixed up or used interchangeably. Sometimes these terms are purposefully used as a form of deception. For example, some home-based opportunities will use the word “job” to suggest they're offering employment when it's actually a form of self-employment. Of course, some people will use the word “job” for any type of work, but when it comes to working at home, it’s important to understand the distinctions so you know what you’re getting involved in. Here are the basic differences between having a home business, being a telecommuter, or working as a freelancer. A home business is an entrepreneurial effort. You own and are the boss of the business. Just because a business is run from home, doesn’t mean it’s a part-time, sideline, or small-time venture. Many entrepreneurs run multi-million dollar companies that have employees working from the comfort of home. Many large companies, such as Google and Disney, started from home. Do work you enjoy. You can turn your passion or hobby into a home business. Get paid what you’re worth. Especially for women, who typically earn less than men for the same job, a home business allows you to set your price. Flexible schedule. A home business can allow you to work around your family's needs or to give more time to personal pursuits. Manage the work in the way you see fit. If you've ever had a job that you felt could be done better, you'll love a home business because you can decide the best way to get things done. Additional tax perks. Home businesses come with a variety of potential tax deductions that can save you money. The success of the business rests on you. It's a heavy burden when every decision, every result, good or bad, depends entirely on you. No guaranteed income. Unlike a job, there is no guaranteed salary. Income fluctuations. Sometimes you'll be flush with cash, and other times money will be tight. You need to be smart with your home business budget and make sure you don't waste money. You may need to work more hours to achieve success. Especially during the start-up, you may work more hours than you would in a job. Lack of resources. Many home businesses have little money and often no help. Tax implications. While there are tax perks, there are also tax rules you need to follow. While there are pros and cons to self-employment, ultimately, the best reason to start a home business is the ability to do what you want, how you want. Starting a business can be fast and affordable with proper planning and management. Telecommuting, sometimes called telework, is a term used to refer to home-based employment. In this case, a company hires an employee that works at home or some other location away from the main company office. Like other forms of work, telecommuting jobs can be done part-time or full-time. Some offer salaries and benefits, while others don’t. Wages or salary offer a stable income. One of the biggest appeals of telecommuting is a regular income. Once you’ve been hired, the need to hustle for work (as in a home business) ceases. Like a traditional job, unless you get fired, the need to search for work stops once you're hired. Ability to work from home or other location as acceptable to the employer. Depending on your employer's wishes, you can work while you travel or from a java joint. Some flexibility in your schedule. Many telecommuting jobs offer flexibility to set your schedule or take time off if needed. Pay and hours are often lower, especially for non-technical or non-professional jobs. Most non-professional telecommuting jobs pay only $8 to $15 per hour. Less flexibility than self-employed or contract workers. While you might have some flexibility, employers still have a lot of power in dictating when you work and whether you can take time off. Most don’t offer benefits. Especially in non-professional jobs, you may not have benefits. Telecommuting jobs are not any more secure than other jobs. Just because you have a stable income in a job, doesn't mean your job is secure. Employers fire and lay off telecommuting employees, too. Finding jobs can be a challenge if you don’t know how and where to look, or how to avoid scams. It's crucial to learn about telecommuting and do your research before seeking a work-at-home job. Work-at-home jobs are extremely competitive. It can take months, even years, to get hired. Isolation. This isn't only for telecommuting. Any time you work from home, by yourself, you run the risk of feeling alone. Although recent reports suggest that telecommuting is waning, more and more businesses are turning to virtual workers to save money while having access to the best workers regardless of where they live. That means you need to be at the top of your game and be a responsible, accountable worker to get hired and stay employed from home. Both freelancers and contractors are self-employed, like in a home business. However, in the case of contractors, they can be “hired” full- or part-time, but are paid as independent workers, not employees. That means they’re like freelancers or home business owners and need to do self-employment taxes. Freelancers and contractors (and even employees sometimes) are often asked to sign non-disclosure agreements (NDA) with the company that hires them. This is to protect the company from having you share its systems, clients, intellectual property, and other aspects of the business to the public or other places (i.e., competitors). Difference Between Freelancer and Contractor: One difference between a freelancer and contractor is that some companies that hire contractors will ask for a non-compete agreement meaning you can’t provide the same or similar service to businesses in the same industry. While you might be asked this as a freelancer as well, generally you have more control over what you do and who you work with as a freelancer than a contractor. Most freelancers do similar work for many clients. Contractor vs. Employee: One thing to watch for when classified as a contractor by a company that "hires" you is that you're not actually being misclassified. Some companies classify workers who are actually employees as contractors. This can be a case of misunderstanding the law, although some companies do this on purpose to avoid paying employee-related taxes. The IRS doesn't like this practice, and there can be penalties for a business that misclassifies employees as contractors. According to the IRS, "A worker is an employee when the business has the right to direct and control the work performed by the worker, even if that right is not exercised." So if an employer directs and controls the work, the worker is an employee. On the other hand, in contract work, the employer can tell the worker what it wants, but how and when it's done is left up to the contractor. 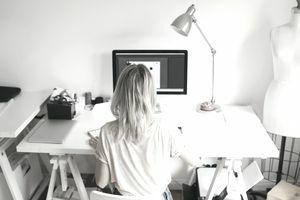 Pros and Cons of Freelance and Contract Work: The benefits of freelancing or contracting are much the same as having a home business, including a flexible schedule and greater independence than given in telecommuting jobs. But the negatives are similar as well, including no benefits, more complicated taxes, less job security, and isolation. Deciding what work-at-home road to take can be difficult. If you like the freedom and flexibility to make your own choices and don’t like being restricted by a company’s rules and policies, then a home business or freelancing is ideal. However, if you like structure and the security of stable income, a telecommuting or contract job might be a better option.